Oxygen is the third most common element in the universe, after hydrogen and helium, and in the 1970s astronomers predicted that molecular oxygen would be the third most common interstellar molecule, after molecular hydrogen (H2) and carbon monoxide (CO). In fact, astronomers have detected interstellar molecular oxygen in only two places: the Orion Nebula and the Rho Ophiuchi cloud (above). But even there the molecule is much rarer than theory predicts. For example, hydrogen molecules in the Orion Nebula outnumber oxygen molecules a million to one. In 1998, NASA even launched a satellite that was supposed to find lots of molecular oxygen but never did—except when scientists, worried that the instrument was faulty, aimed it at Earth. Now, a ground-based experiment has revealed why this life-giving molecule is so rare in the cosmos: because oxygen atoms cling tightly to stardust, preventing them from joining together to form oxygen molecules. The discovery should yield insight into the chemical conditions that prevail when stars and planets arise. To explain the scarcity, astronomers recently proposed that oxygen atoms bind tightly to the dust particles that pepper space clouds. "Everybody knows that the binding energy of atomic oxygen is very important," says Jiao He, an experimental astrophysicist at Syracuse University in New York. "But there was no experimental measurement of this parameter." Now, He and his colleagues have measured this number. The scientists heated two types of solids that make up interstellar dust grains—water ice and silicate—to see how readily oxygen atoms escape. As they recently reported in The Astrophysical Journal, the binding energy of oxygen is more than twice what scientists had calculated decades ago: 0.14 electron volts for water ice and 0.16 electron volts for silicate. That’s high enough to keep oxygen atoms stuck to stardust without the minimal heat of cold interstellar clouds dislodging them. The Orion Nebula may owe its small quantity of molecular oxygen to a shock wave that ripped atoms from the dust grains; Earth's air abounds with oxygen because trees and other plants put it there. "It's a very valuable measurement," says Gary Melnick, an astrophysicist at the Harvard-Smithsonian Center for Astrophysics in Cambridge, Massachusetts, who recently predicted a binding energy about that high. "It explains a lot." Oxygen atoms that float away from interstellar dust grains can join to make molecular oxygen. But when they stay stuck to the grains, hydrogen atoms combine with the oxygen to create water ice (H2O) instead. The water can then become part of asteroids, comets, and planets, setting the stage for the creation of life. 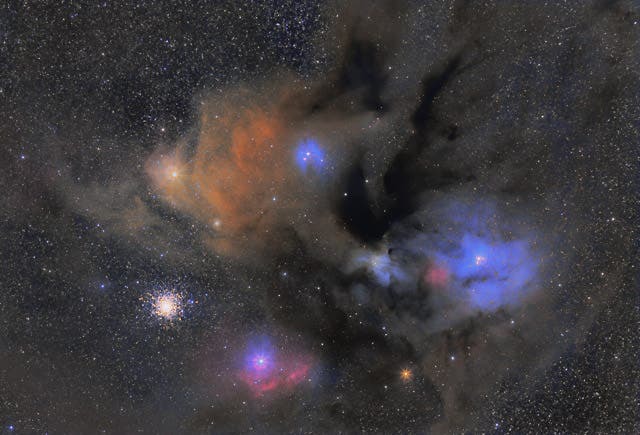 The image at the top of the page shows Rho Ophiuchi, the bright triple star at the right of this image that is surrounded by the blue reflection nebula, IC 4604. At the bottom of the image, the blue star Sigma Scorpii is surrounded by an intense red hydrogen emission nebula. To the upper left of Sigma Scorpii is the large globular cluster M4. To the upper left is the brightest star in the image, the red supergiant Antares, which means "rival of Mars". If Antares were at the center of our solar system, its outer atmosphere would reach to the orbit of Jupiter. Antares' strong stellar wind has created the relatively cool yellow nebula IC 4606 that appears to engulf the star. The field of view is punctuated by part of the the dark nebula B44, known as The Dark River, created from dust that is in front of the surrounding nebula.